As it is the day of the series finale of How I Met Your Mother, I wanted to contribute a small piece of my own to the giant pile of articles and lists that have been filling the internet in the past few weeks. I write this for you in 2005. You are 20. You have no idea how young that is and have so much to learn. I know that probably seems cliche, but it’s true. Nobody knows anything at 20, but that’s what life experience is for. You will be meeting a man soon, and you think this will be your future husband. You’d be wrong, but it’s okay. For who you are now, he is perfect(maybe a little too perfect). Unfortunately, you will only see the cracks in the foundation well into the relationship. The end of the relationship will hurt. It will hurt a lot, and nearly break you, but you need this pain to be stronger. You need this to figure out what kind of man you would rather be with. A man who supports you and challenges you. A man who doesn’t confine himself to romantic television tropes. Let me assure you, you will meet this man, this “perfect-for-you” man, but that will come much later. So much later you can’t imagine why the fates didn’t put you together earlier. And you’ll wish you had those extra 45 days. You are still lost in your search for a career. I won’t lie, this does not change in nine years. But you will know more about yourself and what you want out of a job, even if I am currently not in the end position where I imagine I will be “happy”. It’s okay. More and more, you will realize that it is all about the journey, and you’ve got a long road ahead of you still. Be thankful for it. Some people don’t get a lot of the opportunities you are currently taking for granted. Looking back, I see I had to make what I thought were mistakes to get me to this current place. I had to “screw up”. But I didn’t. I did what was right for me at the time. It seems hard now, but one day you’ll learn to live without regrets(or at least, a minimal amount). Don’t worry about what other people think as much as you do. Everyone is so involved in their own lives, they’re really not paying much attention to you. Trust me, this is a good thing. There will be hard times ahead. You will lose so much, and fall much farther then you ever thought you could. But, you will get back up afterwards and be stronger for it. All those annoyances(for that is what they are) won’t last, but they will if you hold on to them. Call your parents. Tell them you appreciate them as often as you can. Every year, you will realize that is one less that they will be around. Cherish your friends. They will be the ones to stick with you when the bad stuff happens. But remember it’s okay to let friends go too, if they are not contributing positivity to your life. Know that you are surrounded by people that love you, even in your darkest hours and loneliest moments. That may be the hardest thing to remember, but it’s true. Your 20s are going to be amazing, Past Danica. Oh, and there’s a new sitcom premiering in September of this year. I really recommend you check it out. It’ll make you laugh, cry, dance, sing, and want your 20s to be legend–wait for it…. I’m going to try my darndest to post pictures and not make them look perfect. This is difficult for me, because I do want to live the lie. I don’t mind pretending that the apartment looks perfect all the time. But, as we all know, that’s not the truth. The truth is that piles exist, and cat(or dog) fur gets on everything, and to truly live in a space means that you’re probably going to do some living in it. Brandon has suggested taking pictures 3 days after moving furniture, or de-cluttering and reorganizing. This is a good idea. I think it may shed some light on how he and I live, and how you should feel way less guilty that your home doesn’t look like a magazine. Those rooms always look cold anyway. This room, on the other hand, is quite lived in. And I hope, warm and welcoming. We recently made some changes with the living room layout, and and I’m happy to say Brandon had a lot of good input on it. I sometimes feel I may steamroll him into decisions when it comes to decorating and organizing! 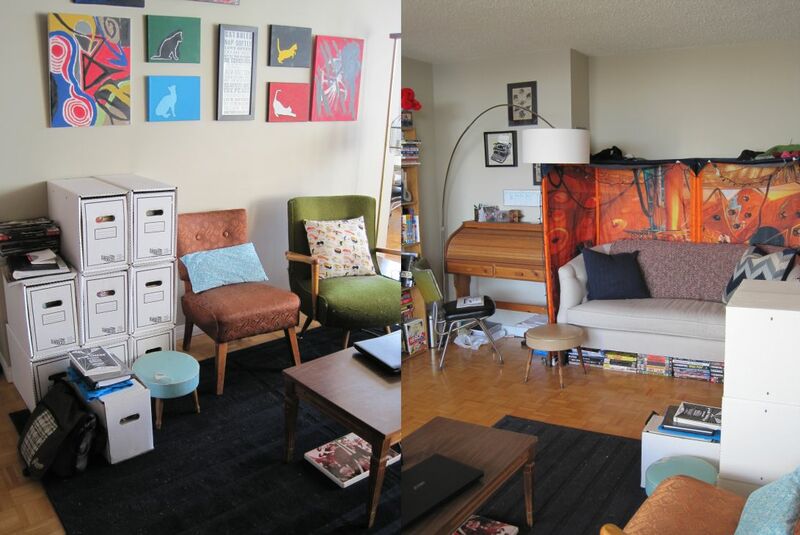 We switched the desk and the boxes, and spread the chairs out to create more reading nooks in the living room. Also, we moved the rug back near the sofa. The living room now looks much bigger, and the sofa has a clear view to the balcony window. Live in your space. Truly live. I spent a long time not being happy with the current state of the apartment, but am getting better at realizing how happy I am with the progress we’ve made. I don’t have pictures from a year ago, but I know how much we’ve been getting out and how much less we bring in. I’m pleased with the current layout, but of course, now I’m thinking about all the little tweaks we can make. Occasionally, I move the knickknacks around to create visual interest(and force myself to dust). Always on the lookout for art, I’m beginning to realize that having bigger pieces on canvas may be a good change of pace. We already have a lot of nice little pieces, but I think having a couple walls with just one thing would be a bit of a knockout. I’m of the mindset that one should only buy art one loves. Which is why a lot of our walls are blank. Good art takes time to find. Will be doing a few little projects this summer. Painting some furniture on the balcony, adding visual interest to the items we already have, adding art. It’s been quite fun moving smaller things around to create a new look. Until next time! I adore this dark grey-blue by Behr, named “Starless Night“. I`ve been seeing deep, rich coloured walls with pops of white or light colours more and more these days. Very inspiring. Even with a small space, you need some room to breathe. Perhaps I should say, especially in a small space. We don’t all live in giant mansions where you can get some fresh air on your tennis court, or relax in the ballroom. That isn’t remotely realistic anyway. Recently, I moved the rug near the sofa again(sadly, not under, but it sort of works), and realized how much more of the floor I could see. This was a huge change in itself. The living room feels larger, and the view to the balcony seems clearer. With only the cat tower and a rocking chair in front of the window, and the sofa opposite the balcony, I can sit and enjoy the view from various angles(and chairs!). Another way to enjoy some empty space is to have open shelving. The room divider we have serves a multi-purpose function both as shelving and lighting. I keep only a couple knickknacks on the upper shelves, while weighing the base down with design and writing books. It looks stylish, and it’s useful, since the writing books are close at hand in Brandon’s office space. It gives me a bit of a thrill knowing I could make floor angels, and I doubt the cats would mind me hanging out on the floor with them! Sorry, but I’m trying to stop apologizing when guests come over. I’m like most people in that I clean a little bit more before people arrive, or clean what I’ve been putting off. I secretly use them as an excuse (or to be kinder, a motivation) to get stuff done. That, I’m okay with. But why is it that I still feel whatever I’ve done is not good enough when friends are in my place? Nothing is perfect, and in the logical side of my mind I know this. I don’t mean to toot my own horn, but I’ve gotten compliments on how well the place is laid out, and usually about the view(which wasn’t my doing, I lucked into that), but never about how clean it is. Because when something is clean, it’s basically a non-issue. We comment(not to the host, heaven forbid) when we see the houses that are dirty and grimy or full of stuff, but in “polite society”, you don’t mention how there are no dishes in the sink. That would be silly, right? Even though the cleaning takes more effort and energy then simply letting everything stay where it was(including the dust). Often, the apology will slip out before I even know it’s happening. My friends will say “pish posh, nonsense!” because my friends are “Alice in Wonderland” characters and we’ll move on from there to dinner or a movie. I love my place, so I’m not sure where the shame comes from. I’m proud of the work Brandon and I have put into this place the past couple years, and look forward to a day where we can do more than simply move the furniture. Ah, apartment living. Remember to celebrate your home and your space. You’ve put a lot of yourself in it. My version of minimalism is not a nearly empty room, with only three items inside. It is not every surface painted white, so it looks “clean”. It’s not only having one set of utensils, because I think this is a bit crazy. My version of minimalism means that I use everything in my space. I have a deep emotional attachment to the most items, and the rest is functional and used often. I try to live by a quote from William Morris. “Have nothing on your houses that you do not know to be useful, or believe to be beautiful”. That is my goal. This is what I think about when I organize, and when I’m attempting to make my life and space feel a little bit smaller. Small isn’t so bad. I’m not sure where everyone started getting the idea that bigger is better. Bigger is just more. Small can be freeing. Small can be exciting and interesting. Small can be big. I’ve seen people do more in less square footage then I’ve currently got. Once you’ve whittled down your space to everything you use and care for, don’t stop. This is a lifetime process. Start by thinking what you’re bringing into your space, and if you really need to. You may have a different opinion about something a year from now then you had today, and it might be okay to let it go. We can’t keep everything forever. Nothing everything can be an heirloom.